DESIGN: Flexible, soft, retractable, reusable, sealed, hygienic, accordion design for adults and children. ENOUGH TO HOLD 2 PEE: Adult flexible urinal bottle is 700ml/25oz can hold adult pee 2 times at least. FOR YOUR NATURE CALL: Emergency use for traffic jam, light and convenient, safe and sanitary. When you are in a hurry when you go out to move. If the road is blocked or the toilet is difficult to use. Camping and other leisure activities. Nursing patients with inconvenient mobility. Please use under parental care. Quality - Made of environmental protection material. Completely Hygienic and easy to use, reusable or disposable. Design - The bottles are retractable, sealing performance is great, will not leak when the urinal put down. 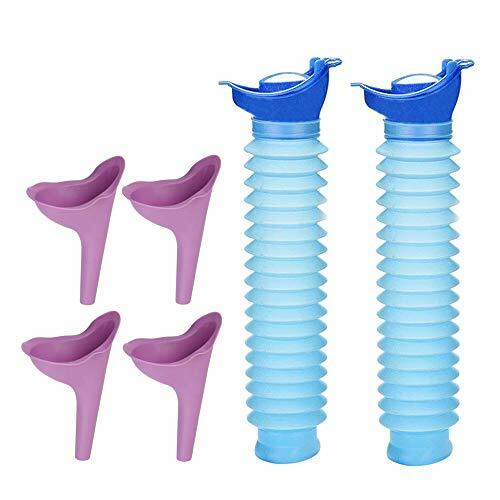 The funnels are soft and flexible. Design for adults and children. Portable - Lightweight, save space and easy to carry, you may carry them while you are traveling, camping, hiking and traffic jam. Capacity - Extreme capacity is 700ml/25oz can hold adult pee 2 times at least. Easy to clean. Reusable after cleaning. Useful - Necessities for long distance car driving, outdoor camping activities, hiking and journey etc. Emergency use for traffic jam, persons in wheelchairs, bedside backup etc. If you have any questions about this product by Zivisk, contact us by completing and submitting the form below. If you are looking for a specif part number, please include it with your message.